6 Courts on plan are 312 feet for reference. Remove this section of fence because the east holding area is no longer used by Streets and Sanitation Dept. Then add a 3 foot slope in this old holding area. Walkway is 480 feet long or a 2.7% slope (ADA allows 5% slope). Holding Area No Longer Used. This access has been available and used for over 50 years. With the complete redevelopment of the park, it is legally required to be made handicap (ADA) accessible. Other Links in this Maggie Daley Park Issue. Please share your opinions and comments with your neighbors. Required long-standing Park Entrance from Lower Randolph. The Americans for Disabilities Act (ADA) requirements pertain to access from the public street level of Lower Randolph or Lower Harbor. Many current and future buildings in the New Eastside have exits and entrances on these lower levels, and the ONLY ACCESS to Grant Park (or these sections of Peanut Park, Maggie Daley Park, Millennium Park) from these lower levels is at the Lower Randolph/Harbor entrance that is the focus of this request for ADA compliance. For at least the last 54 years, the residents across the street at 400 Randolph, and now many additional buildings have had access to this entrance to Grant Park, and still will have access to this entrance after the completion of the new Maggie Daley section of Grant Park. This growing list includes: 400 Randolph, 155 Harbor, 360 Randolph, 175 Harbor, 195 Harbor, Lancaster, 340 Randolph, Regatta, Chandler, Benton townhomes, the future Wanda Towers, and the 4 future high rise buildings in the northeast corner of the New Eastside. All other entrances and facilities within the new Maggie Daley Park have been made handicap ADA accessible. 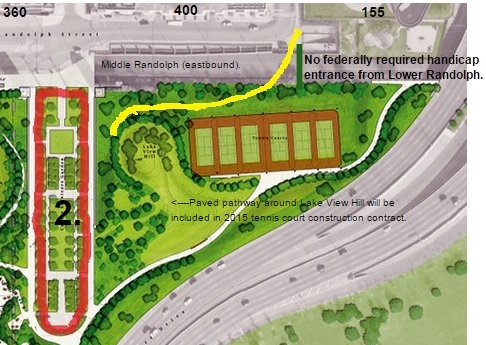 However, the entrance from Lower Randolph was over-looked in the initial designs during 2010 and early 2011. During all six public hearings, the public convinced the park district that this historical entrance was still needed. The park district finally agreed and added the entrance in the January 13, 2012 #3 design, and June 13, 2012, #4 design: ( http://www.neweastside.org/LowerRandolph.html ) However, without public notice or knowledge, it was "removed", apparently between the CHICAGO PLAN COMMISSION meetings on July 19, 2012 and August 16, 2015. The website graphic was dated August 17, 2012. Construction began with the first stake being pounded for the fence around the entire site on October 12, 2012. 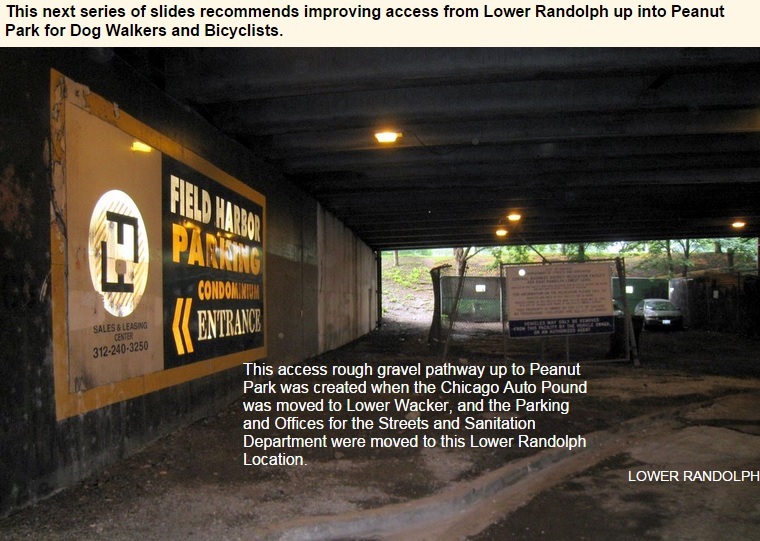 Subsequent inquiries to the park district officials about the Lower Randolph entrance/exit in late 2012, 2013, 2014, and early 2015 received no response. 2. It would have resulted in the "loss of most of the trees along the northern edge of Peanut Park to make the connection." Note from the picture above, it appears that all the trees can be avoided. 3. Acknowledged that "an accessible path would have been required by code"..however because of 1 and 2 , it was not possible. Hopefully the park district will again acknowledge that "an accessible path would have been required by code", and now will add it to the Walsh completion contract, while the earth moving equipment is on the site. Without the legally required ADA access from Lower Randolph and Lower Harbor, a person would have to climb a stairway up to the north side of Middle Randolph, and then cross 6 lanes of traffic with a six-inch curb separating the east and westbound lanes. A curb on both the north and south sides of Middle Randolph further makes that route an impossible nightmare for a handicap person in a wheelchair, and very dangerous for everyone else. Before the Streets and Sanitation replaced the Auto Pond about a decade ago, this park entrance was much wider and more easily accessible. 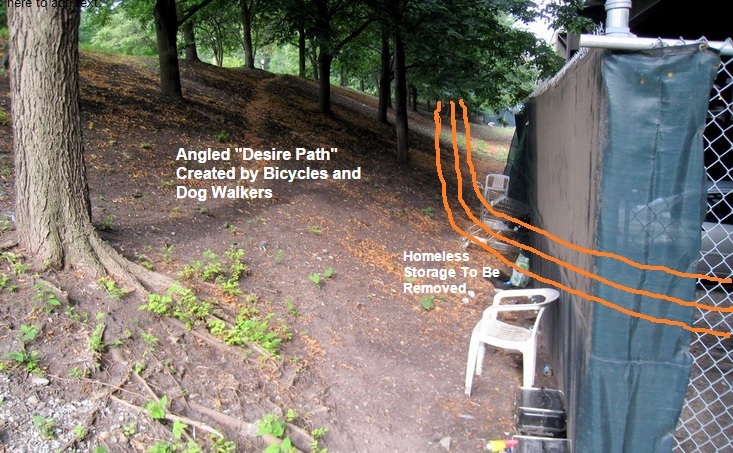 For a couple of months it was completely closed off a decade ago, then the outcry from residents made the City Streets and Sanitation Department move the fence to create at least a crude rough gravel entrance to a very difficult slope up into the park. It remained in use by bikers, pedestrians, and dog walkers. Since the new Maggie Daley Park was proposed in 2010, the neighborhood has continuously attempted to get the park district and the New York design consultant to acknowledge the requirement for this entrance. Because the unused broken fence and gated holding area is now available, in addition to the narrow existing entrance, it affords an opportunity to create a wider and more gradual slope across this area and southwest up the slope (avoiding all existing large trees) to meet the approved walkway around the Lake View Hill in Peanut Park. (1) At least one accessible route complying with 4.3 shall be provided within the boundary of the site from public transportation stops, accessible parking spaces, passenger loading zones if provided, and public streets (like Lower Randolph !!) or sidewalks, to an accessible building entrance. 4.3.3 Width. The minimum clear width of an accessible route shall be 36 in (915 mm) except at doors (see 4.13.5 and 4.13.6). If a person in a wheelchair must make a turn around an obstruction, the minimum clear width of the accessible route shall be as shown in Fig. 7(a) and (b). 4.7.2 Slope. Slopes of curb ramps shall comply with 4.8.2. The slope shall be measured as shown in Fig. 11. Transitions from ramps to walks, gutters, or streets shall be flush and free of abrupt changes. Maximum slopes of adjoining gutters, road surface immediately adjacent to the curb ramp, or accessible route shall not exceed 1:20.
and pedestrians during the past five decades.